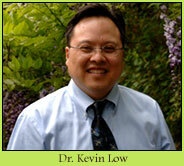 Dr. Low grew up in Palo Alto and attended Menlo School and U.C. Davis, graduating from both with honors. Like his father, he chose a career in dentistry and received his dental degree from the UCSF School of Dentistry. It is there that he met his dentist wife, Dr. Whitney Lorenz. When Dr. Low is not at the office, he enjoys golf and is active in the University Rotary Club of Palo Alto.